Products | Willard Shutter Company Inc.
Flat picket screens offer flexibility and simplicity. Picket orientation can be horizontal or vertical, and allow 15% free airflow. They are simple & affordable and can accommodate a wide variety of layout conditions. Like all EconoSpan® louver products, they ship in knock-down kits complete with detailed installation instructions, and install quickly. 22-1/2° Pitched Louvered screens offer maximum visual concealment while allowing for adequate ventilation. This louver configuration allows for 30% free airflow, and the louver can be inverted (flipped upside down) to provide even more concealment from line of sight if needed. This very effective design is very attractive and convenient for large projects. Like all EconoSpan® louver products, they ship in knock-down kits complete with detailed installation instructions, and install quickly. 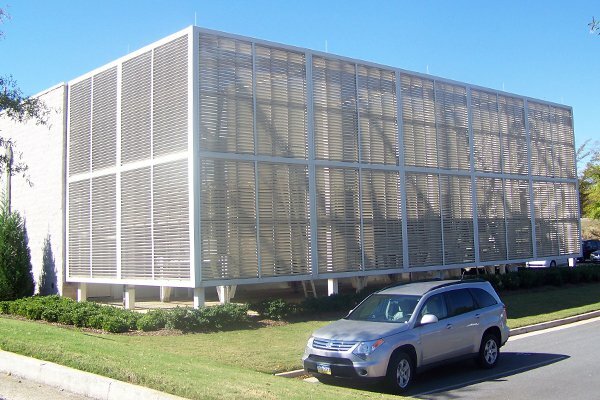 45° Pitched Louvered screens offer maximum airflow and provide significant concealment as required for HVAC and other circulation demanding industrial equipment. This configuration allows for 60% free airflow, and the like the 22-1/2° louver can be inverted to provide additional concealment from line of sight. This system is extremely effective and convenient for large projects. Like all EconoSpan® louver products, they ship in knock-down kits complete with detailed installation instructions, and install quickly. The Islander® Screen System is a convenient, modular louvered panel system that installs onto an engineered supporting structure. Panels are made to order based on customer requirements and are available in a variety of finishes. 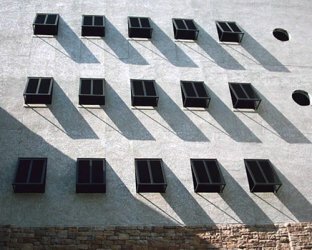 Louver spacing can be provided in 1-1/4″, 1-1/2″ or 1-3/4″ spacing increments, and allow for 40%, 50% or 60% free airflow. 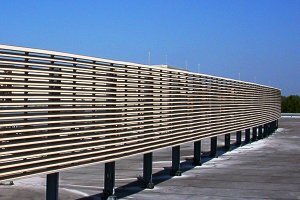 This system is ideal for pedestrian areas that require a less industrial, more traditional open type louver. 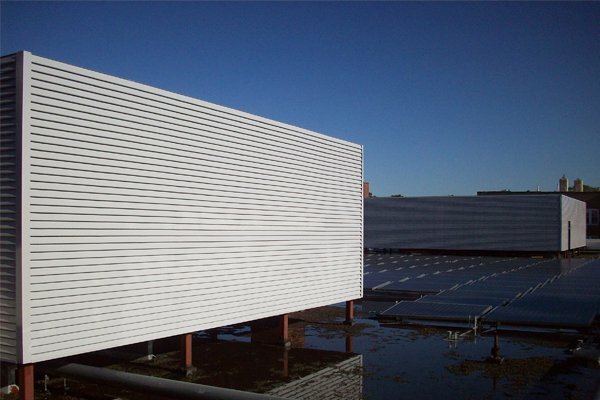 The Islander® Louver is a convenient, modular louver panel that is adaptable to a variety of applications. It can be fabricated to a wide range of sizes and configurations, and available in a variety of architectural finishes. It is ideal for high aesthetic applications such as shopping malls, architectural facades, and other pedestrian areas that require a less industrial, more traditional open type louver. Because of its intrinsic aesthetic appeal and extreme flexibility, the Islander® remains the most popular of our “non-industrial” commercial louver systems among architects today. Adapted from our popular EconoSpan® system, this louver system provides a very cost effective solution for medium duty and light-industrial louver applications. This system can be provided in Flat, 22-1/2°, or 45° louver orientations and be made to fit within openings that require a varied degree of concealment or protection from exposure. The system is typically provided as a knock-down kit, but can also be provided in pre-assembled framed sections depending on project requirements.quickly. For the more demanding, industrial louver applications, Willard manufactures a variety of heavy duty, extruded aluminum louver systems. Both 4″ and 6″ deep systems are available, and are offered with popular drainable or weather resistant, non-drainable louver configurations. 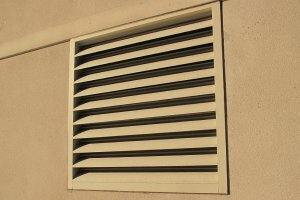 Our custom manufactured extruded louvers fit a variety of demanding applications such as parking garages, equipment rooms, ventilation louvers, and various areas that require a heavy duty louver for secured ventilation. 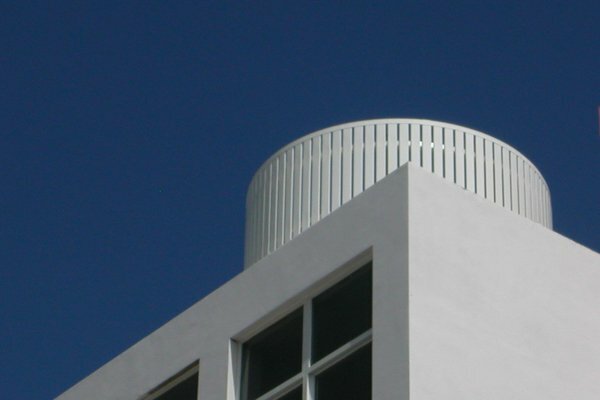 All louvers are made to order and offered in a variety of architectural finishes. Islander® sunshades, fabricated using the flagship, Islander® panel, suit a variety of sun control applications. They can be fixed overhead between structures as in walkways, or mounted on supporting structures on building facades. A most popular method is “top mounting” using a continuous hinged header and fixed stays or adjustable extension arms. Because of their flexibility and inherent aesthetic value, they are used widely across the industry in residential, commercial and institutional applications. They come in pre-assembled panels and are available in a wide range of architectural finishes. EconoSpan® sunshades provide a cost effective solution where a large format (3-3/8″) louver might be suitable. It is attractive and affordable. In this configuration, the EconoSpan® system provides light duty shade on a light duty budget. This system can be provided in Flat, 22-1/2°, or 45° louver orientations. It can be fabricated into pre-assembled modules and made to fit within openings. Alternately, it can be hinged at the top and projected at an angle using fixed stays or adjustable arms. 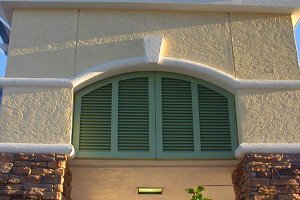 Willard manufactures a variety of made to order sunshade solutions featuring extruded solid louvers, airfoil louvers, and various architectural profiles. When it comes to these specialties, this is our business. Over 60 years of proven experience has empowered us to be invaluable as the “go to” resource for architects and project manager alike. 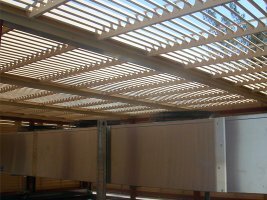 Our in house design department can assist in custom tailoring pragmatic solutions for virtually any louver & sunshade project. Our commitment to doing things right and impeccable reputation for service give comfort to our clients, and guarantee a successful delivery of innovative, custom louver products. Colonial Louvered shutters feature an easy to operate, TRUE open louver system that captures the charm and sophistication of traditional wooden louvers. The traditional, colonial shutter is hinged at the sides and opens to the left and right of the window or door opening. It is held open by friction catches, shutter dogs or hook and eye hardware. When closed, it is secured in position by means of a horizontal “storm bar” secured to the shutter by machine screw and machine screw anchor. 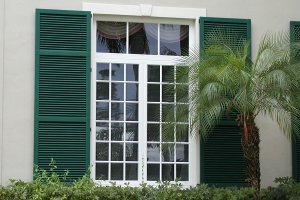 Islander® Colonial shutters are manufactured using the flagship, Islander® Panel. They feature roll-formed box frames reinforced by internal extruded aluminum I-Beam. They are affordable and strong. The all extruded Colonial Shutter is manufactured using 100% extruded materials and meets the most stringent hurricane code requirements in the industry. Along with storm bars, this system may be provided with an optional, integrated pin-latch system allowing for “tool-less” operation. ​Bahama Louvered shutters feature an easy to operate, TRUE open louver system that captures the charm and sophistication of traditional wooden louvers. The Bahama Shutter hinges at the top and projects out over the opening giving protection from sun and weather, and closes securely over the opening in seconds. It features a continuous, extruded aluminum header (top hinged mounting device), and is supported in the open position by adjustable (telescoping) or fixed arms. It is secured in the closed position with a mechanical tie down (machine screw and machine screw anchor) or an optional, integrated pin-latch system that allows for tool-less operation. The shutter projection is adjustable unless specified otherwise, and may project up to a maximum angle of 44°. 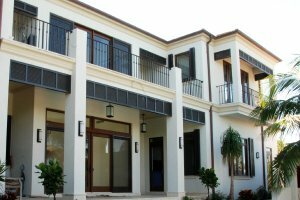 Islander® Bahama shutters are manufactured using the flagship, Islander® Panel. They feature roll-formed box frames reinforced by internal extruded aluminum I-Beam. They are affordable and strong. It is available in 3 louver spacing increments: 1-1/4″, 1-1/2″, & 1-3/4″. 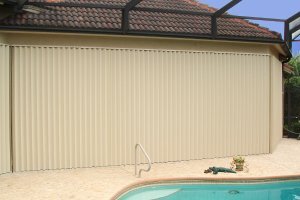 The Islander® Bahama is widely used for sun control and storm & weather protection. It can be used with fixed or adjustable extension arms. 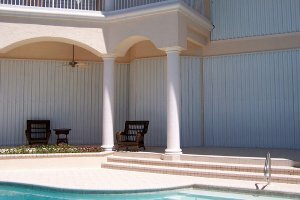 The all extruded Bahama Shutter is manufactured using 100% extruded materials and meets the most stringent hurricane code requirements in the industry. This is an excellent choice for a combination of sun-control and severe storm protections where impact approval is required. This system uses a storm-bar type securing system with mechanical ties downs. It may also be provided with an optional, integrated pin-latch system allowing for “tool-less” operation. ​Willard Rolling Shutters, also known as roll-up shutters or over-head coiling shutters, consist of a self-mating horizontal slat systems that open and close by operation of an over-head axle tube suspended in a shutter housing or over-head cavity. These shutters are available in a variety of configurations to suit various applications. They can be effectively used for hurricane & storm protection, security, privacy, sunshade, and insulation. Also offered are a variety of electronic controls and accessories such as remote controls, security keypads, timers, weather & light sensors, low voltage dry contacts, and other intelligent, smart house controls allowing customization in order to satisfy today’s modern architectural smart system designs. ​​Simple to operate, the Folding Accordion Shutter provides immediate protection from hurricanes, storm, and burglary/ intrusion. It is economical without sacrificing performance. The shutter glides along extruded aluminum tracks using nylon rollers mounted on stainless steel carriages, and can be secured from the inside or outside using aluminum locking rods and an optional key-lock. When open, blades stack neatly like an “accordion” at the sides of the opening. It’s easily adapted to most window and door openings, and widely used to protect large areas like sliding glass doors, balconies, and lanais. The folding design allows for virtually unlimited left to right runs, and gives the product the unique ability to enclose entire areas from a single set of blades. ​​Removable storm shutters and panels are designed to be “put up” in the event of a hurricane or storm by placing them into a pre-installed panel mounting system over a window, door, or other area to be protected. Economical and easy to use, these products protect against flying debris and water penetration associated with hurricane force winds, and made available in various materials to suit application and budget. They are typically taken down and stowed away in a storage area when not in use. Designed with convenience and storage in mind, removable storm shutters and panels are a huge advantage and recommended alternative to cumbersome “homemade”, plywood shutters.